There will be a new champion in 8-Man, Division II this year as two-time defending champion Victoria has moved up to 8-Man, Division I. Hanover finished as the 8-Man, Division I runner-up last season and have returned to Division II this fall where they are 3-0 and ranked No. 1 in the Kpreps Rankings. Looking at the 8M-II districts through four weeks, it isn’t long before your attention shifts to the strength of District 6. The six teams in District 6 have combined for a 15-9 record; only matched by District 2. Of the District 6 contenders, a veteran Dighton Hornet team enters district play as the only unbeaten. Hodgeman County (3-1) and Otis-Bison (3-1) are both ranked in the Kpreps poll, while Sharon Springs-Wallace County’s (2-2) losses have come to undefeated teams. Tribune-Greeley County is perhaps a surprise at 3-1, but the Jackrabbits’ three wins have come against opponents that are a combined 0-10. On the east side, District 2 includes fifth-ranked Caldwell (4-0) and unbeaten Hutchinson Central Christian. The Cougars, a long-time club team, have joined the KSHSAA ranks this season and are playoff eligible. District 2 also includes a talented Hartford team and another surprising team in Norwich. The only other unbeaten in 8M-II is Mankato-Rock Hills. Waverly (2-2; 2-0 district) – The Bulldogs possess some momentum, coming off consecutive victories against Colony-Crest and Marais des Cygnes Valley. Waverly outscored the two opponents 92-6. The Bulldogs seek their first playoff appearance since 2013. Lebo (2-2; 1-0 district) – The Wolves’ two losses were to a pair of undefeated teams in 8-Man Division II’s top-ranked Hanover and 8-Man Division I’s third-ranked Burlingame. Last week the Wolves held Pleasanton on a 4th-&-goal at the 1-yard line to preserve the 32-26 win. Lebo played without quarterback Drew Ott in that game. Lebo eyes its first winning season since finishing 6-3 in 2013. Pleasanton (1-4; 1-1 district) – The Blu-Jays have already played five games after playing Missouri opponents Pierce City and Greenfield in a span of a few days. Pleasanton suffered a key district loss last week, falling 32-26 to Lebo. The Blu-Jays, who have won only three games in the last three seasons, haven’t enjoyed a winning record since 2008. Colony-Crest (2-2; 1-1 district) – The Lancers dropped a key district game, falling 44-6 at Waverly during the third week of the season. Junior Gage Adams has playmaking ability, rushing for more than 260 yards during the season-opening win against Blue Valley Randolph. Coach Chuck Mahon hopes to lead Colony-Crest to its third winning season in a row. Chetopa (1-3; 1-1 district) – Jaunc Bradshaw’s Green Hornets have allowed 48 points or more in three of their four games. Senior running back Ryan Gainer has been Chetopa’s top offensive weapon, rushing for 214 yards and six touchdowns during a 56-6 win over Altoona-Midway. The Green Hornets have battled numbers and won only three games since finishing 10-1 in 2014. Altoona-Midway (0-4; 0-1 district) – The Jets have been outscored 198-6 this season. Altoona-Midway is 0-21 over the last three seasons. The Jets haven’t won since October 27 of 2011 when they defeated Tyro Christian, 45-24. Altoona-Midway scored a total of 16 points in 2015 and 7 points in 2014. Marais des Cygnes Valley (0-3; 0-2 district) – The Trojans have allowed at least 48 points in each of their games this season. This is coach Brandon Wise’s first season after taking over for veteran coach Butch Jones, who directed the Trojans to a 6-4 record last year. MdCV is battling depth with one report with the Trojans having only 11 players out for football. Caldwell (4-0) – The Blue Jays have delivered the state’s highest scoring offense through four weeks with 250 points. Caldwell, which finished 5-6 last season, owns a key Week 2 victory against Argonia-Attica when the Blue Jays scored 90 points. Senior Colten Ward, a four-year starter, leads a host of experienced and talented players that includes Dilyn and Dakota Volavka. Hutchinson Central Christian (4-0) – Central Christian has been a nice surprise after years of not playing at the KSHSAA level. The Cougars, which have qualified for state in Class 1A, Division II boys’ basketball the last several years, have multiple players who keyed the basketball success, including junior quarterback Nate Heneha. Central Christian has outscored opponents 224-66 after a 4-5 year as a club team last fall. Hartford (3-1) – Hartford enjoys a prolific offense behind quarterback Danen Kistner and all-purpose threat Clayton Fowler returning from a 7-3 squad. However, the Jaguars continue with some defensive issues versus quality teams in a 62-12 loss versus Burlingame in Week 2, and a 52-30 home victory over Madison the following week. Hartford is 10-4 (including a forfeit) in the last two seasons but has permitted at least 30 points seven times. The Jaguars will play at Central Christian, host Caldwell and at Norwich in Weeks 6-8, respectively. Norwich (3-1) – Norwich has already bettered its win total from a 2-7 season last year, its fourth straight 2-7 fall. The Eagles fell 46-0 at home versus South Barber in its only test against a team with more than one victory. Norwich’s only three wins have come against teams with a combined 2-10 mark. Even if Norwich doesn’t make the playoffs, a winning season would be a significant improvement for a program that hasn’t make the playoffs since 2008. Eight offensive starters return, including senior quarterback Nick Kyle. South Haven (1-3) – The Cardinals struggled with defense last season en route to a 3-6 mark. This season, defense has again been a problem with 54, 66 and 64 points permitted in the three losses. The Cardinals get Hartford and Caldwell both on the road. After reaching the playoffs for ten consecutive seasons, South Haven has missed the postseason the past two years. Burrton (0-4) – Burrton has dropped 12 straight games after a season-opening 41-12 home victory versus Fairfield-Cunningham to open last season. That victory ended a 32-game losing streak. This season, the Chargers have permitted 240 points in four games. Hanover (3-0) – The Wildcats had a Week 2 bye but have pitched shutouts in all three victories with a 22-0 turnover-plagued win versus Lebo in Week 1 and victories against Southern Coffey County (50-0) and Linn (48-0) the last two contests. Hanover is the two-time defending Eight-Man, Division I runner-up. All-state senior quarterback Will Bruna again leads the offense and passed for 231 yards and four scores last week. Wakefield (3-1) – Wakefield lost at Goessel, 38-24, in Week 1 and then bounced back with three straight victories of 10, 12 and 32 points. In each contest, the Bombers’ scoring offense rose from 22 to 48 to 60 points. Wakefield has been a solid team under ninth-year coach Chris Freeman with three straight winning seasons and no years under four wins in the last six. But the Bombers have no playoff appearances since 2006. Junior Justin Carver has rushed 67 times for 386 yards and seven scores, while sophomore Skylur Merritt has 306 passing yards, 265 rushing and 11 TDs accounted for. Wakefield has an average score of 39-24. Axtell (2-2) – Axtell went 10-2 each of the past two seasons and then suffered heavy graduation losses, namely all-state dual threat quarterback Colton Buessing. While Buessing was injured for a time last season, sophomore Kaleb Buessing stepped in and played well, but Kaleb and family moved to Montana over the summer. Axtell has tallied 150 points but has permitted 174, including a 66-16 loss at St. Paul in Week 4. Frankfort (2-2) – Frankfort, which finished 5-5 last season, has averaged 30 points a contest but allowed 40. Senior quarterback Adam Kenworthy rushed for 228 yards and five scores in the season-opening 42-34 win against Onaga, and then accounted for seven scores in a 62-12 win at Valley Falls in Week 4. Blue Valley Randolph (1-3) – BVR looks to take another step forward after a winless season in 2014 and a one-win year last fall. The Rams have scored just over 25 points a contest but allowed 42. They did defeat Southern Cloud, 72-40, in Week 4 for its first win this season. Wetmore (0-4) – The Cardinals are looking for their first varsity victory since resurrecting the program. Wetmore has nearly won twice this season with a 24-14 season-opening defeat versus Valley Falls and a 40-34 home loss against Madison on a Hail Mary pass last week. Mankato-Rock Hills (4-0) – Rock Hills has moved down to Division II after a 7-3 mark last fall. The Grizzlies rank third in the classification with just 32 points allowed. Senior quarterback Luke Broeckelman is 19 of 24 passing for 487 yards with nine scores against no interceptions. He has also rushed for four scores on 12 carries. Speedy sophomore Zane Colson has 43 carries for 360 yards and six TDs, while junior Tycen Higer has 10 catches for 215 yards and five TDs. Junior Austin Eilert and Colson have each returned a punt for a TD, while sophomore Dereck Gillet has an interception. Beloit St. John’s-Tipton (3-1) – BSJT lost to Osborne, 50-18, at home in Week 2, though won its other three games 56-32, 50-22 and 57-12. The Bluejays have averaged 5.1 yards per rush, a big improvement from 3.3 last season. Senior quarterback Davis Dubbert has thrown for 693 yards with a 9/4 TD/INT ratio and rushed for 184 yards with five TDs. Junior Ty Brummer had 67 carries for 383 yards and six scores. BSJT does have seven turnovers and is even in turnover margin. Pike Valley (3-1) – The Panthers narrowly lost at Osborne, 34-32, in a well-played game last Friday. Pike Valley, which has won a playoff game in each of the last two seasons, has averaged 290 rushing yards and 108 passing yards per game. Junior Lane Peters has 78 carries for 637 yards and 12 scores. He has cleared 100 yards in each contest. However, the rest of the offense has plenty of depth, an aspect that pleases coach Don Melby. Junior quarterback Davante Hammer has thrown for 374 yards with a 7/1 TD/INT ratio, and junior Cole Strickler has 30 touches for 364 yards and six TDs. He also leads the team with 36 tackles. Linn (2-2) – Linn lost 28-8 to Clifton-Clyde in Week 1 and 48-0 versus Hanover in Week 4 with blowout victories against Blue Valley Randolph and Wetmore by a combined score of 100-6 in the middle two weeks. Junior Evan Bott and senior Kalen Richardson have combined for 509 rushing yards and eight scores. Tescott (1-3) – The Trojans have permitted 47 points a contest. Its lone victory was a 36-14 Week 3 win against Blue Valley Randolph. Southern Cloud (0-4) – Southern Cloud has just one victory in the last three seasons and has lost 15 straight contests. The Warriors have scored 30 and 40 points in two of the defeats but has lost every game by at least 32 points. Sylvan-Lucas Unified (3-1) – Sylvan-Lucas opened 3-0 but then lost 60-34 to then-winless Chase at home last week. The Mustangs have matched last season’s win total and have tallied at least 34 points in six straight contests. Wilson (3-1) – Wilson quietly went 6-3 last season and played Rock Hills to a 32-18 loss in Week 1, then defeated Chase, 30-26, in Week 2. The Dragons rolled over struggling Southern Cloud and Tescott the last two weeks. Wilson has easily the district’s best defense with 94 points allowed. Northern Valley (1-3) – Northern Valley has faced a challenging schedule and had problems with defense, allowing 211 points. The Huskies, though, opened with a home loss versus Alma, Neb. and then lost big to unbeaten teams Logan-Palco and Dighton. Senior quarterback Caden Kinderknecht has passed for 386 yards and rushed for 553 yards with 13 TDs accounted for to lead an offense that averages 5.1 yards a carry. However, the Huskies have had trouble with turnovers, including five interceptions. Northern Valley hasn’t made the playoffs since 2005. Lakeside-Downs (0-4) – The Knights have lost 19 straight contests dating back to a 36-6 win at Sylvan-Lucas in Week 3 of the 2014 season. This year, Lakeside has played three squads that are 4-0 and 2-2 Hoxie. Stockton (0-4) – Stockton has tallied just 58 points and lost every game by at least 26 points this season. The Tigers have lost six in a row and are 3-28 since the start of the 2013 season. Thunder Ridge (0-4) – The Longhorns opened with three straight shutout losses before a 54-14 loss at Bennington last week. Thunder Ridge has lost 10 straight dating back to a 28-20 home win versus Stockton in Week 2 last season. Dighton (4-0) – The Hornets, which allowed 24 points per game last season, opened with three straight shutouts and then permitted 18 in a blowout victory against Northern Valley last week. The Hornets have played the second easiest schedule in the classification, according to Prep Power Index. Senior quarterback Tyler Lingg is a four-year starter who has completed 35 of 47 passes for 526 yards with nine touchdowns versus no interceptions. Senior Lake Lewis has 34 rushes for 330 yards and 11 scores. Senior Dylan Foos has 18 catches for 332 yards and six TDs. Dighton has some trouble with turnover margin the last several years but has no miscues and plus-10 in margin this season. Hodgeman County (3-1) – Hodgeman County’s only loss came Week 2 38-6 against Spearville, which has won 17 straight contests. The Longhorns delivered a key 66-22 win versus previously unbeaten South Central last week. Junior quarterback Jacob Salmans has thrown for 485 yards with nine scores against two interceptions. Jacob, Eli Salmans and Carson Cahoon have shared time in the backfield for a team that averages 152 rushing yards a game. Sophomore Luke Shiew has 49 tackles. The Longhorns finish the season with home versus Wallace County, at Dighton and home against Otis-Bison. Otis-Bison (3-1) – The Cougars led Central Plains until the final minute when the Oilers scored twice, including a pick-six on the final play, for a 40-28 victory. Otis-Bison bounced back to beat rival Victoria, 46-36, on the road. Senior Kade Urban has played very well under center, while junior Blake Bahr has stepped in for senior Brad Lightfoot (ankle) at running back. Otis-Bison has several linemen banged up, including center Landon Hoopingarner. The Cougars open with a road game versus Wallace County this Friday and later have to play Dighton and Hodgeman County. Tribune-Greeley Co. (3-1) – The Jackrabbits have quietly put together a nice first month. Greeley County went 4-5 last year but lost Seth and Levi Johnson when they transferred to Wallace County. The team lists just 12 players on its roster, though owns wins versus Quinter, Deerfield and Rolla after a 46-0 season-opening loss versus Hoxie. Sharon Springs-Wallace Co. (2-2) – The Wildcats opened with two close losses versus St. Francis and Atwood-Rawlins County, two squads that remain undefeated. Wallace County missed standout Grady Hammer for the second and third weeks, but he played versus WaKeeney-Trego (50-0) last week. 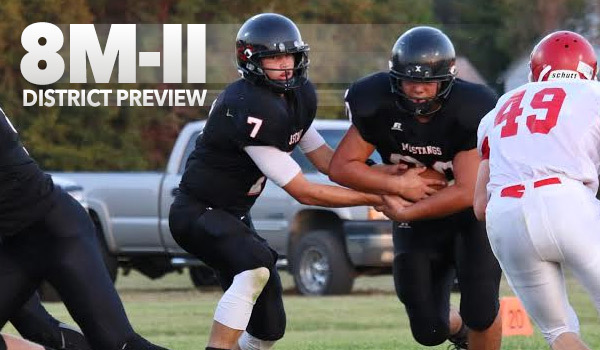 The Wildcats, who defeated Hoxie in Week 3, have played the classification’s second-hardest schedule. Senior Levi Johnson has accounted for seven offensive scores. The Wildcats have already scored three non-offensive touchdowns and allowed just 70 total points. Triplains-Brewster (0-4) – The Titans, a playoff team last year, were expected to step back after incurring heavy graduation losses. Opponents have outscored Triplains-Brewster 194-40. Pretty Prairie (3-1) — The Bulldogs opened with a 54-22 loss at Hutchinson Central Christian and then reeled off three straight victories versus Fairfield (52-6), at Skyline (72-34) and at Burrton (60-8). Pretty Prairie went 7-2 last season but lost out on a tiebreaker to Caldwell. The Bulldogs have outscored opponents 206-102. South Barber (3-1) — South Barber rose to No. 5 in the rankings before a 40-26 home loss versus Argonia-Attica last Friday. The Chieftains had opened with just six points permitted in their first three contests. Senior quarterback Grant Cantrell has completed 33 of 48 passes for 526 yards with eight scores against no interceptions, along with 47 carries for 230 yards and five TDs. Ashland (2-2) – Ashland had trouble with road games versus South Central (34-8) in Week 1 and Spearville (60-8) last Friday, teams that are a combined 7-1. However, Ashland defeated Fowler, 52-14, and Kiowa County, 50-26, at home in the middle two weeks. Bucklin (1-3) - Bucklin won at Fowler, 36-28, in Week 4. The Red Aces earned two wins last year, its best record since a 6-2 season in 2007. Chase (1-3) – Chase posted 9-1 records each of the last two seasons, though opened 0-3 this season before a 60-34 road win versus previously unbeaten Sylvan-Lucas last Friday. The Kats have allowed at least 30 points in each contest and are on a stretch of four of five road games, including three straight. The stretch includes at South Barber and at Pretty Prairie. Stafford (1-3) – Stafford has allowed 60 points a game in its three losses, though did defeat winless Burrton, 60-34, on the road in Week 2. Ingalls (3-1) — Ingalls went 19-3 in the last two seasons with a playoff win each year before significant graduation losses and a new coach. However, new coach Vestal Teeter has led the Bulldog to 50 points a game, including a close, 44-38, victory at Kiowa County last week. Senior Colton Schmidt returns as the starting quarterback. Minneola (2-2) — Minneola defeated Kiowa County, 42-22, to open the season before losses against South Central (38-8) and Spearville (54-8). The Wildcats defeated South Gray, 60-28, last week. Minneola has won a playoff game each of the past two seasons. Moscow (2-2) – Moscow won against Satanta, 30-28, last week. It opened the season with a 44-12 victory at Balko, Okla., followed by losses against eight-man newcomer Leoti-Wichita County (46-0) and Tyrone, Okla. (52-6). Rolla (0-2) – The Pirates have had trouble scheduling games with two open dates and a 52-6 loss versus Springfield (Colo.) in the season opener. Rolla also lost 56-8 defeat against Greeley County in Week 4. Rolla has one victory in the last two years. Deerfield (0-4) – Deerfield has scored just 12 points this season and lost every contest by at least 38 points. Not counting a Week 7 forfeit last year, the Spartans have lost six straight contests. Fowler (0-4) – The Goldbugs had a close game in Week 4 with a 36-28 loss versus Bucklin. The other three games came by margins of 48, 38, and 52 points. Fowler has dropped 12 straight games.